Garage organization. Two words which strike fear into everyone. The space is a big mess. It’s full of junk. And, there’s no rhyme or reason to it all. You may or may not be able to park your car. 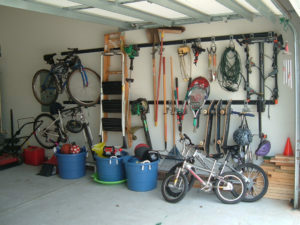 Whatever the case, you need to reclaim the space and that means garage organization is your only solution. Before you rush into the work, you should have a plan for what to do with all that stuff. You know, those things you don’t use, don’t need, and don’t want. Sure, you’ve stuffed them into corners and out of the way places. But now, with a garage cleanout in the works, you’ll need a method for getting rid of a whole bunch of stuff. So, you’ll need a strategy in order to stay on track and move forward. This is why you should call in a junk removal service. They’ll do all the work for you and haul away anything you don’t want. This way, you don’t have to worry about separating out junk from recyclables, and more. Empty it out. Start by emptying the garage completely. Leave nothing inside. Although this presents a big challenge, it will prove invaluable because it will motivate you to purge as much as possible. Arrange items according to usage. As you put things back, arrange them according to priority. Meaning, put stuff you most use in easy to reach places and things you use the least elsewhere. If you need a garage cleanout done, just phone 800-433-1094 or visit Junk Garbage Removal.